Yesterday we focused on collecting data via APIs (application program interfaces). While APIs are great, sometimes they don't give us the data which we want or need. We're bound by what they give us and somewhat limited in that sense. As an alternative, one way to get Internet data is to scrape the websites themselves for connections. Say we want to get a sense of how several political candidates are connected to each other, or to understand how particular online communities organize through their websites. Those are some examples in which scrapers can thrive. The idea behind scraping is that we're looking at all the links on a webpage and listing each of the links as a connection. We are then looking at all the links on the pages linked from the original page. And so on and so on. In computer science, this is known as a breadth first search. 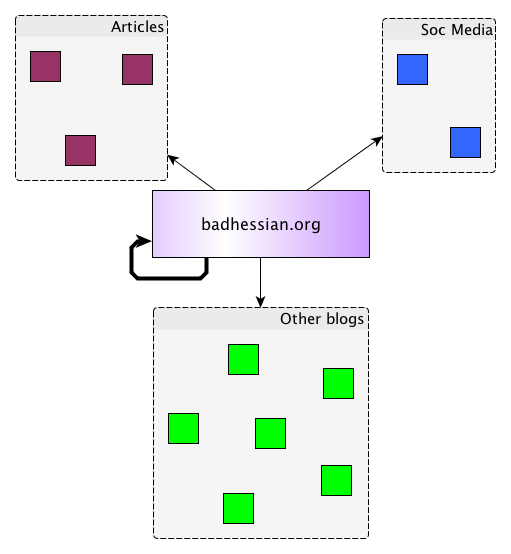 So, for instance, on my blog Bad Hessian, there are a set of links that can be traversed. This is a post drawn from this post. 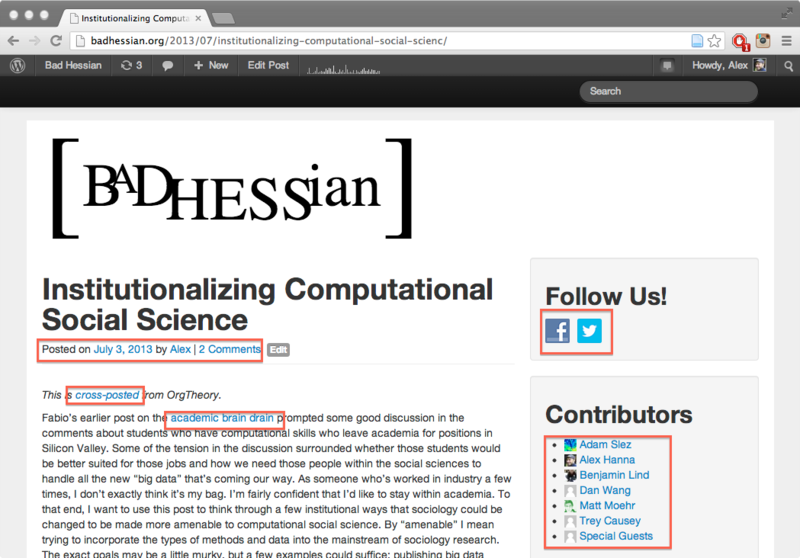 where $O_i$ is a link on the OrgTheory article. Note that $B_1$ has been removed from the list because we've already visited the link. If we are looking into a particular kind of phenomenon, like a blogging community, maybe we want to restrict our links to those that link to other blogs. How do we do that? 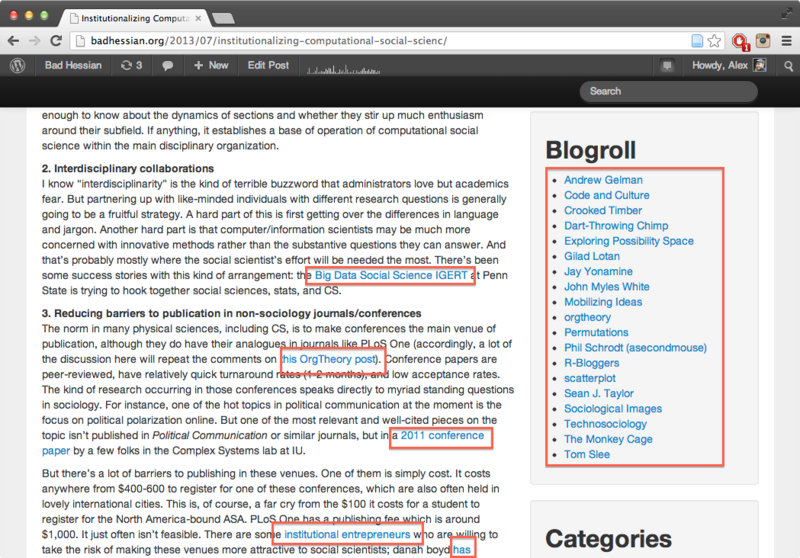 Luckily, blogs tend to shared the same sorts of URLs. Blogspot, Wordpress, and Livejournal all have similar URL structures. For this exercise, we're going to focus on collecting network data on blogging networks. Like yesterday, you first need to connect to the Amazon EC2 server. The hostname is ec2-54-225-7-147.compute-1.amazonaws.com. If you are in Windows you need to log in with PuTTy, and if you are using Mac, you would be logging on with the Terminal. This sets up the basic framework for the scrapy Python package. We won't get much into the complicated internals of the package. Once you've done that you need to enter into the hse-scraping/blogcrawler/ directory. The intuition behind this file is in the allowed_domains list and the parse_item function. We are just trying to get blogs, so there are a list of blogging services from which we will choose to gather information. The downside is that we don't get blogs that are not on one of these services. Next, look at the parse_item function. This function is called every time that the crawl visits a link. The "item" here can be considered a network edge. url1 is the source node while url2 is the destination node. This outputs the data from the crawler into a CSV file which represents an edgelist. You'll see a lot of stuff being produced when this is happening. The process could go on indefinitely. To stop the process, press Ctrl + C and it should close itself. Give it a few seconds to do so. If you look at the Blog Roll on the side of the page, you'll notice that this closely matches the list of blogs listed there. You'll note that many of the blogs will repeat themselves on the first line -- that means they are linking to themselves. Like the diagram above, these nodes are in a loop. There are a lot more options available in scrapy. If you want to learn more about scrapy and the various types of tasks you can accomplish with it, you can check out their documentation.